4 Pics 1 Word all ANSWERS and cheats of the game (^_^) UPDATED!! All the answers for 4 pics 1 word !! Don´t get stuck, find the 4 pics 1 word answers you need and still have fun with the game that has hooked millions of people. Leave your comments at the bottom of the page, we will be happy to help you with all the answers you will ever need at all times. For easy and quick access to all responses of the game 4 pics 1 word add this page to your favorites list in your browser (www.4-pics-1-word.com). Return to this page every time you need answers and continue to enjoying. Did you know Four Pics One Word is the most addictive brainteaser in the world? There are over 200,000,000 players enjoying the game across the globe in different languages. 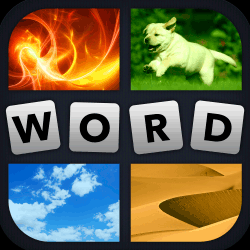 4 Pics 1 Word is a game for iPhone, iPad, iPod and Android. This game was created by LOTUM GmbH with more than 3,000 puzzles. These puzzles show four pictures in each level that have one word in common. Do you dare to decipher what’s the word? In case you get stuck on some level, do not worry. We are here to help you with that word and you can continue playing with other levels. This game is available in 8 different languages: English, Spanish, French, German, Russian, Italian, Dutch and Portuguese. If you are studying one of these languages 4 pics 1 word for you will be an excellent tool for learning while you play. Even if you have not downloaded the game, now is a good time to do so, go to the download area of your mobile device and start having fun with Four Pics One Word. Hello, thanks for the answers!!! Hello, my nephew accidentally click and some money automatically were paid. I want to cancel it. What should i do? You can contact with the Customer Service for the game via email at games@lotum.de. Don’t forget! Include the name of the app, the device and operating system you’re using.